Born Timothy Ware in Bath, Somerset, England, Metropolitan Kallistos was educated at Westminster School (to which he had won a scholarship) and Magdalen College, Oxford, where he took a Double First in Classics as well as reading Theology. In 1958, at the age of 24, he embraced the Orthodox Christian faith (having been raised Anglican), traveling subsequently throughout Greece, spending a great deal of time at the Monastery of St. John the Theologian in Patmos. He also frequented other major centers of Orthodoxy such as Jerusalem and Mount Athos. In 1966, he was ordained to the priesthood and was tonsured as a monk, receiving the name Kallistos.In the same year, he became a lecturer at Oxford, teaching Eastern Orthodox Studies, a position which he held for 35 years until his retirement. In 1979, he was appointed to a Fellowship at Pembroke College, Oxford, and in 1982, he was consecrated to the episcopacy as a titular bishop with the title Bishop of Diokleia, appointed to serve as the assistant to the bishop of the Ecumenical Patriarchate's Orthodox Archdiocese of Thyateira and Great Britain. 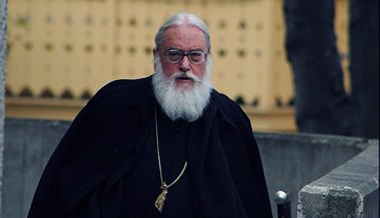 Despite his elevation, Kallistos remained in Oxford and carried on his duties both as the parish priest of the Oxford Greek Orthodox community and as a lecturer at the University.Since his retirement in 2001, Kallistos has continued to publish and to give lectures on Orthodox Christianity, traveling widely. Until recently, he was the chairman of the board of directors of the Institute for Orthodox Christian Studies in Cambridge. He is the chairman of the group Friends of Orthodoxy on Iona. He serves on the advisory board of the Orthodox Peace Fellowship. On March 30, 2007, the Holy Synod of the Ecumenical Patriarchate elevated the Diocese of Diokleia to Metropolis and Bishop Kallistos to Titular Metropolitan of Diokleia. Kallistos Ware on a Trinitarian life. Kallistos Ware's thoughts on Christ's love. Kallistos Ware's thoughts on God. Kallistos Ware's thoughts on the Eucharist. Kallistos Ware's thoughts on prayer.